The Everything Easy Cleanse Book is an instruction manual offering advice, recipes and tips for undertaking a healthy detox diet. It was created by Cynthia Lechan Goodman, a nutrition consultant, chef, and personal trainer, who regularly develops body cleansing programs for her clients to help them overcome digestive disorders, release excess weight and improve their overall health. Firstly, Goodman explains why it is important to cleanse your body and what benefits you can expect when you undertake a cleansing diet. She then explains the difference between various types of cleanses such as the flush type, the fasting type, and cleanses based on blending foods. According to her it is important not to regard a cleanse as a “one-time, flush-it-out quick fix”. Instead you should think of it as a commitment to cleansing not only your body but also your lifestyle of all the factors that are negatively impacting your health. A variety of different body cleanse diets are provided and these are categorized into chapters related to the positive effects they have on certain health problems. Each chapter includes information about the specific health issue, how a cleanse can help, the best nutrients for the condition, the foods you should emphasize, recipes, and what to do after the cleanse. All of the cleanses are meant to be used for a maximum of three days. For each cleanse you will choose nutrient rich meals for breakfast, lunch and dinner and two small nutrient snacks in between. It is also important to be sure to drink at least eight glasses of water or herb tea throughout the day. The last chapter of the book outlines post-cleanse guidelines providing instruction on ending your cleanse, how to transition back to a normal diet, tips for maintaining good habits, and recipes for eating after the body cleanse. Berries, apples, bananas, raisins, spinach, kale, cabbage, broccoli, carrots, tomato, asparagus, shitake mushrooms, sunflower seeds, walnuts, almonds, flaxseeds, tempeh, eggs, nonfat yogurt, quinoa, garbanzo beans, navy beans, wheat germ, miso, sauerkraut, protein powder, fresh herbs, spices, sesame oil, molasses, honey, herb tea. After you complete your body cleansing diet you should do a combination of cardio and strength training exercise, aiming for four times a week, as well as walking every day. Stretching is also important because it decreases stress and enhances oxygen and blood flow to the tissues of the body. 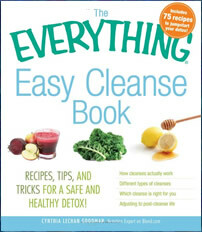 The Everything Easy Cleanse Book: Recipes, tips, and tricks for a safe and healthy detox! retails at $15.95. Explains the benefits of cleansing. Can help to jump-start a healthy lifestyle. Encourages the intake of foods rich in probiotics such as kefir, yogurt, miso, tempeh and sauerkraut. Provides information specific for the management of a variety of health conditions. Author is a nutrition consultant and chef. Very restrictive and not possible to eat out during the cleanse. All of the meals will need to be prepared from scratch. Does not include meal plans. Is not a long-term approach to healthy weight loss. The Everything Easy Cleanse Book provides a variety of cleansing diets designed to benefit a range of different health conditions and goals. This book offers a safe and gentle approach to cleansing as well as guidelines to help you to continue with a healthy lifestyle after you have completed the cleanse.